Easter Brunch was a good idea because of everyone’s hectic schedule this year and brunch seems easier to prepare than dinner. I made the Lemon Mousse Cake and it turned out very tasty! It was light and slightly tangy. Reminds me of lemon ice cream but lighter. 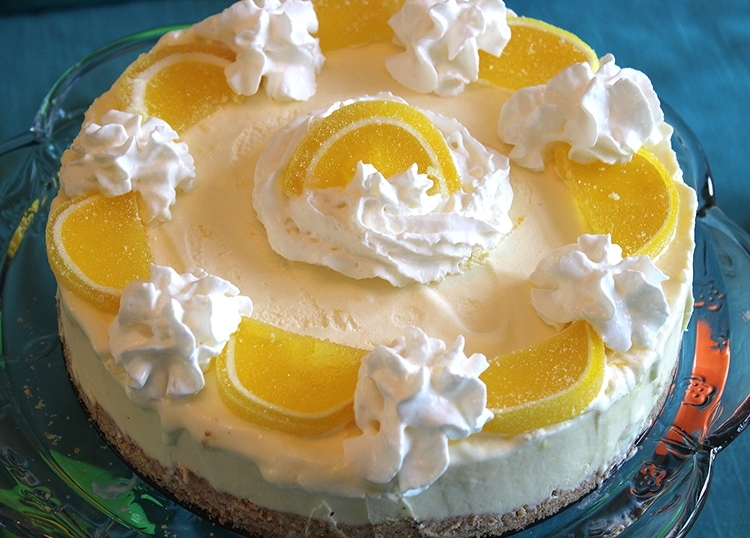 I used a recipe from All Recipes for Lemon Mousse Cake but I changed it a little. I couldn’t find the lemon drop candy that the recipe called for so I used these lemon slices that made it delicious for sure! The candy is in the cookie crust as well as on the top of the cake. Not only is the recipe easy to make but you need to make it the night before so it freezes and that saves you a lot of time on a busy day! To prepare the crust, combine the crushed vanilla wafers with the melted butter and 1/4 cup of the finely chopped candy Mix well, then press into the bottom of a 9-inch springform pan. Refrigerate while proceeding with the recipe. Whisk together egg yolks, lemon juice, lemon zest, and 2 tablespoons of sugar until smooth, then set aside. In a separate bowl, beat the egg whites until foamy. Sprinkle in the cream of tartar and continue whipping until soft peaks form. Gradually add 3/4 cups of sugar while continuing to whip to stiff peaks. Fold the egg yolk mixture into the egg whites, then gently fold in the whipped cream until no streaks remain. Spoon this mixture into the chilled crust, and place into the freezer. Freeze for at least 8 hours before serving. Remove from pan just before serving by running knife around sides of spring form pan and lifting cake out of pan and placing on serving plate. Decorate the top with whipping cream and candies.